In Costume Jewelry > Show & Tell and Costume Jewelry > Sherman Costume Jewelry > Show & Tell. 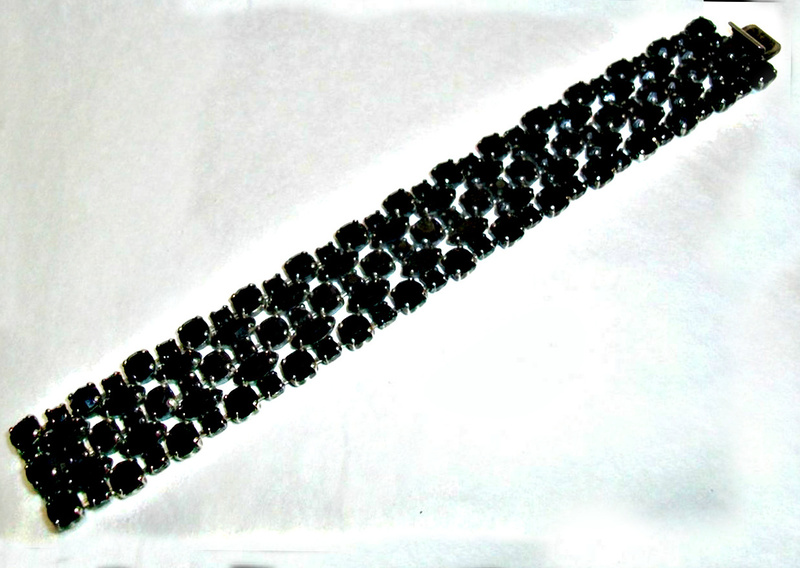 This handsome and impressive bracelet dates from the late 1950's, made by the well known Canadian firm of "Sherman" designed as a five line bracelet featuring two lines of marquise shaped crystals and three lines of alternating medium and small round shaped crystals. The bracelet is done in a series of dazzling and intense black jet color round and marquise shaped crystals set in a plated setting. 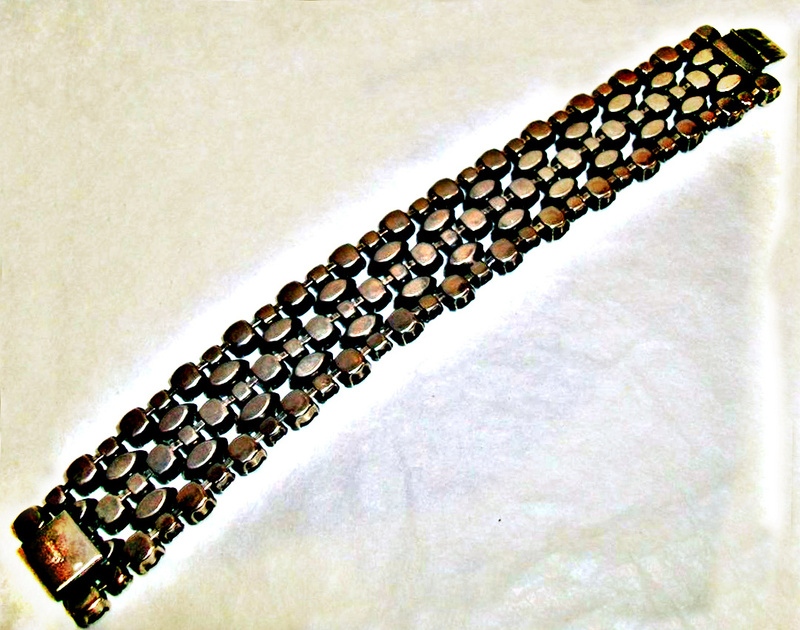 The bracelet measures 7" in length, the bracelet is in excellent condition showing only normal use all the original stones, none missing or replaced with no loss to the plating or finish on the back of the bracelet. The bracelet is marked on the beck of the clasp, Sherman in script letters. 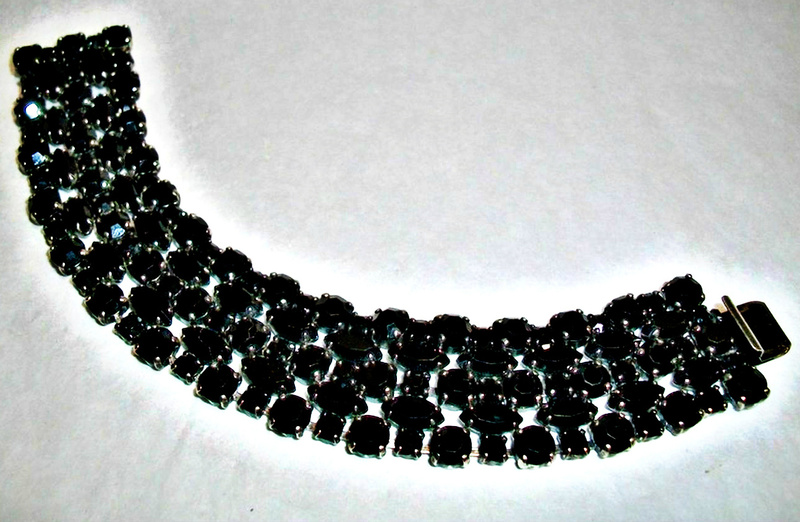 The cool thing with black is that it goes well with most anything and how well this blends with your fine collection!! 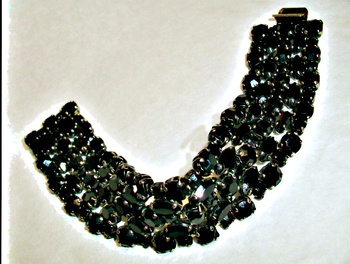 Fantastic bracelet, striking in black! Phil, it's not so easy is it? This is a stunning black bracelet! A gorgeous, wonderful bracelet. You buy the very best! I like everything about this from the shape to the color.Very Nice piece. Thank you jscott for your comment. Goodness...I have no Sherman pieces in my collection but have looked at them occasionally and not anything that piqued my interest...until now. Absolutely stunning!